Aikatsu Friends! – Baton Pass | Mezashite! This entry was posted in Aikatsu Friends!, Aikatsu Stars!, Aikatsu! by Akatsukin. Bookmark the permalink. I’m subscribed to get updates when you post new releases, so I was surprised and excited to see you post a video about Friends (which I didn’t expect to see anything about until episode 1 subs are released). I usually don’t look at the pictures or read the writing if I can help it before I view episodes, but this time I read what you wrote before downloading and watching. I didn’t look at the picture, so I was surprised to see the back of Ichigo’s head when the video started . It was interesting to see a little of Aine’s (pink/orange’s hair’s) personality. Given how extreme her personality was I was surprised we didn’t get a similar level of reveal of on Mio’s personality. Guess that will come in episode #1. Looking forward to it. Aikatsu Friends! will be the last Aikatsu series for the Heisei era. I have return! 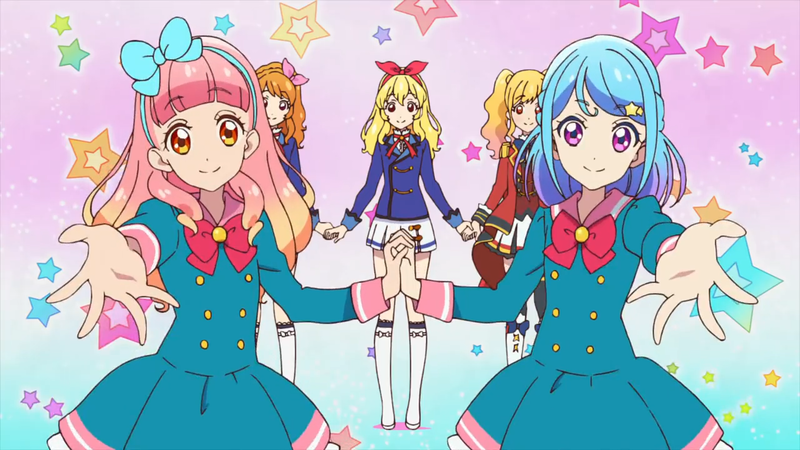 Last January or maybe february I discovered that Aikatsu will have its third title (friends). So I am happy to announce that I’ll be downloading episode week by week. I didn’t do it with stars because basically I didn’t want. But actually I am watching Stars. I am in episode 50 something. I really like Aikatsu, so I’ll continue watching until it end. Having watched episode 1 of Aikatsu Friends raw (and with a minimal, at best, mental translation ability) I am already in love! You and your team are doing amazing work! Way to keep your Fankatsu strong, and your Subkatsu too! Can I use your scripts to be reuploaded and translated to different languages? If I could, I’d like to sub Aikatsu Friends in my local language. It may be difficult given the way we translate, but if you want to use it go ahead. We’d prefer if you also gave us credit too.